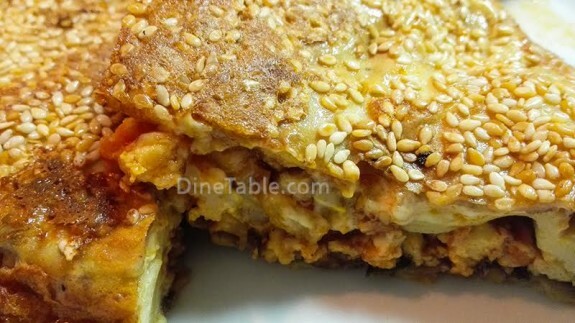 Paneer Stuffed Pancake Recipe is a tasty and healthy snack which is simply pancake stuffed with paneer & cheese fried in egg dip. This is an excellent Iftar item for Ramadan, for Kids lunch box, evening snack or starter for all parties. Paneer and cheese is an excellent combination which makes every dish rich and tasty. 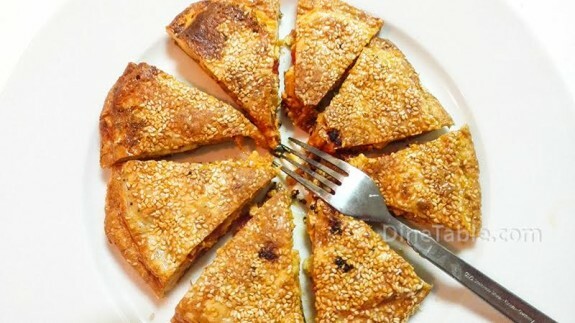 The pancakes are arranged in layers with fillings inside which gives the taste of paneer and cheese in every bite. 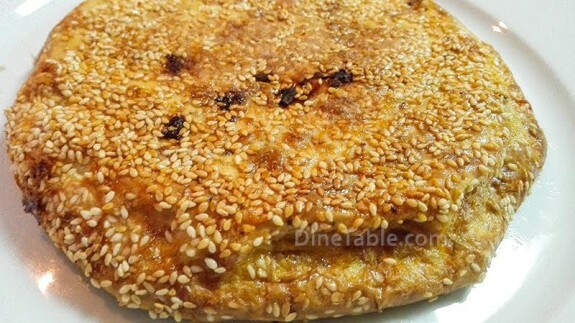 Hope you all try this tasty and healthy Paneer Stuffed Pancake Recipe / Ramadan Snack Recipe. Click here for other delicious Stuffed Pancake Recipes. First make the paneer filling. To make paneer filling, heat a pan and saute all ingredients listed to make the filling for 5 to 6 minutes and keep aside. In a blender, blend all the items required to make pan cake. The batter to make pan cake is ready. In a non-stick pan make 3 pancakes. Dip one side of one pancake in egg and place the pancake on a non-stick flat fry pan. Switch on the flame and keep on very low flame. 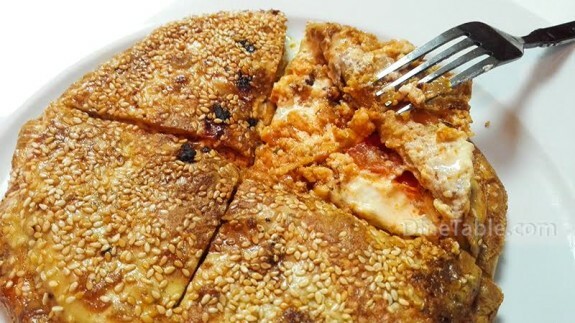 Spread paneer filling on the pancake followed by one cheese slice. Repeat step 5 and 6 once again. Then place 3rd pancake on top and add the remaining egg on top of the pan cake. 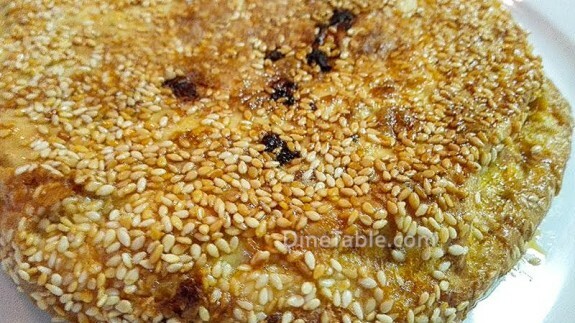 Sprinkle white sesame seeds on top. Cook on very low flame for a minute with lids closed and flip to another side. Allow to cook for another 1 minute or until the egg coating is fully cooked. 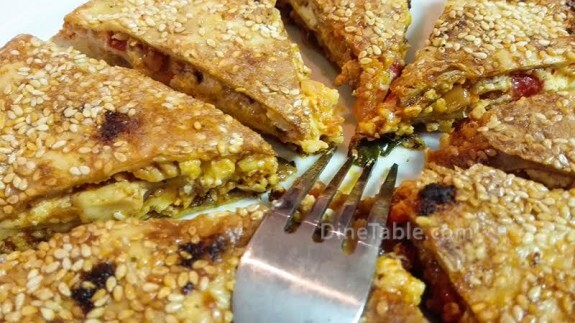 Switch off the flame and the yummy paneer stuffed pancake is ready to serve.